Visit Tanzania and take part in hiking the Kilimanjaro via the Marangu route on this 6 Days Umbwe Route Kilimanjaro Hiking Safari. Contact us to book this safari. Your guide and climb support crew arrive at your hotel in the morning. Introductions and a last brief equipment check precede your drive to the Umbwe Gate of Kilimanjaro National Park. This entrance, situated at 1,640 m above sea level, is where your trek starts. The head-guide will finalize the permits and registration for search and rescue services. Your first day trekking is meant to bring you to Umbwe Camp for your first mountain overnight. Climbing up to 2,930 m is a long haul with a significant increase in altitude, so find the right pace for the whole group and stick with it. As this part of Umbwe route goes through rain forest with its probability of rain showers- do not forget your raincoat. Your support crew will have prepared the camp and dinner by the time you get there. We encourage our clients to use Diamox in the mornings prior to the day’s climb. This reduces altitude sickness symptoms. Consult your doctor on the use of Diamox before leaving home on this trip. Nightly discomfort often accompanies acclimatization. However, while such symptoms as headaches and nausea are common, make sure you inform your guide of them immediately. Early wakeup, breakfast and the start of trekking to Barranco Camp. The rainforest will quickly give way to brush, and if it is not too cloudy you will be able to see Meru Volcano for the first time. 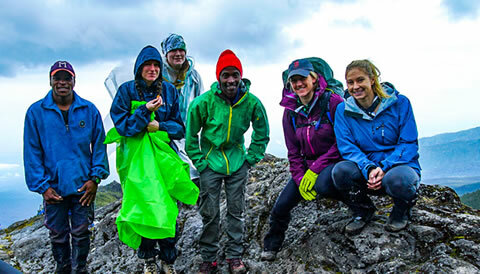 Trekking on Umbwe route for this day will be of a moderate length, and around lunchtime you will reach Barranco Camp (3,960 m), which is nestled inside a huge volcanic fault. Lunch will be provided here, and then you have the opportunity to relax for the rest of the day, which significantly facilitates the acclimatization process. End of the 6 Days Umbwe Route Kilimanjaro Hiking Safari.